Villa Estival is a very attractive and comfortable villa, built in traditional style with local stone with a charming rustic feel from heavy wooden beams and traditional interior. 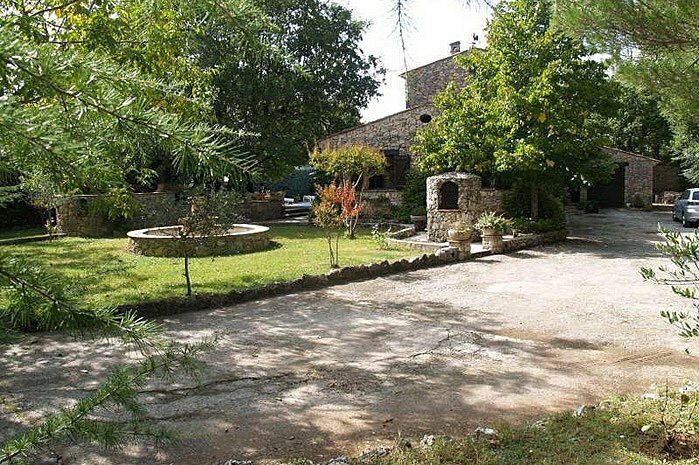 Villa Estival is a very attractive and comfortable villa, built in traditional style with local stone with a charming rustic feel from heavy wooden beams and traditional interior, yet with all the mod cons. Very close to the village of St Cezaire, you can walk there from the villa and enjoy the restaurants and bars, in summer there's also a weekly evening market each Thursday. Within a short drive is the bustling town of Grasse, the perfume capital and the coast between Nice and Frejus is within easy reach by car. On the upper floor is a cosy, master double bedroom decorated in traditional French style, it has an en-suite bathroom with bath, shower and toilet and a private balcony where you can enjoy the morning sunshine overlooking the pool and gardens. Twin bedroom with a small sitting area and a wash-room with basin and bidet, the lower sloping ceiling makes it more suitable for children. On the ground floor are two double bedrooms, each with a TV, the bedroom shown with the red bedspread, has doors to the pool and gardens. Shower room and separate toilet. Large, well equipped farmhouse-style kitchen with breakfast table and doors to a shaded terrace. Open plan living and dining room with enormous solid wood dining table with bench seating, the living area has comfortable leather sofas and chairs, there's a fireplace and French windows to the covered terrace. Set in extensive well-tended grounds with mature trees giving shade, the enclosed gardens are secluded and private and cover over 2600 sq metres. The attractive pool is accessed via steps in the shallow end and has spacious sun terrace with areas of natural shade throughout the day. There's a delightful covered terrace overlooking the pool and a large barbecue area with dining table beneath the shade of a mature tree. There's also a covered parking bay within the wooden gates.